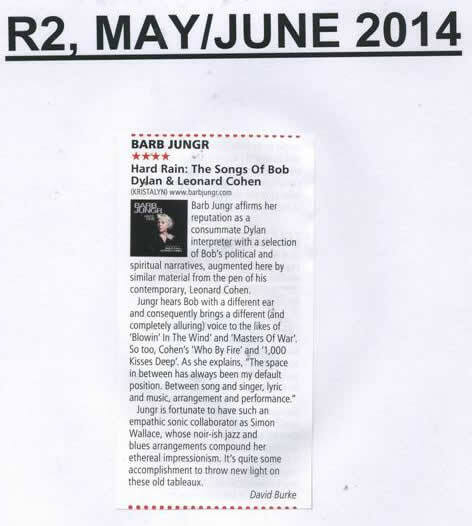 "The readings of these Dylan songs reaffirm Jungr's standing as a Dylan interpreter; her loose, easy version of Chimes of Freedom — made famous as a hit by The Byrds — emphasises that Jungr rivals the group as one of the best. In no way does it detract from her abilities as a Dylan interpreter to say that the revelation of Hard Rain is that her versions of the Cohen songs all but steal the album. As an album, it is the equal of Jungr's two all-Dylan ones but, more importantly, it opens up a rich new seam for her to mine. More!!" 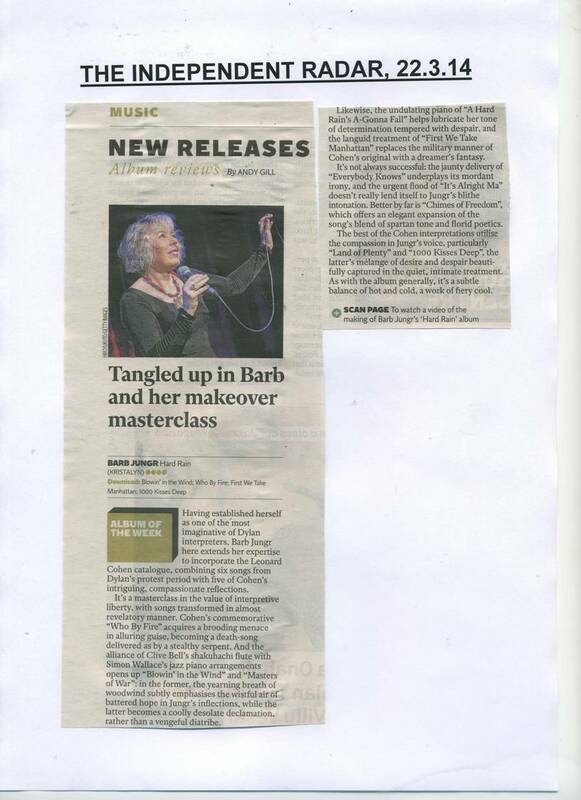 "It's a masterclass in the value of interpretive liberty, with songs transform in almost revelatory manner. As with the album generally, its a subtle balance of hot and cold, a work of fiery cool." 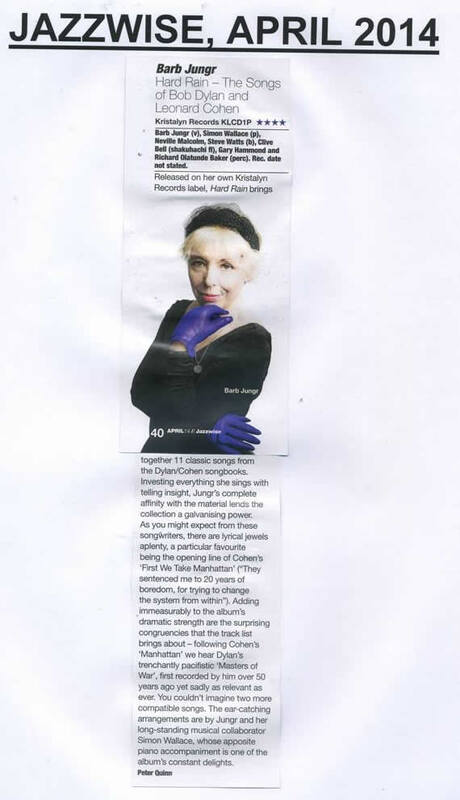 "Investing everything she sings with telling insight, Jungr's complete affinity with the material lends the collection a galvanising power. There are lyrical jewels a plenty." 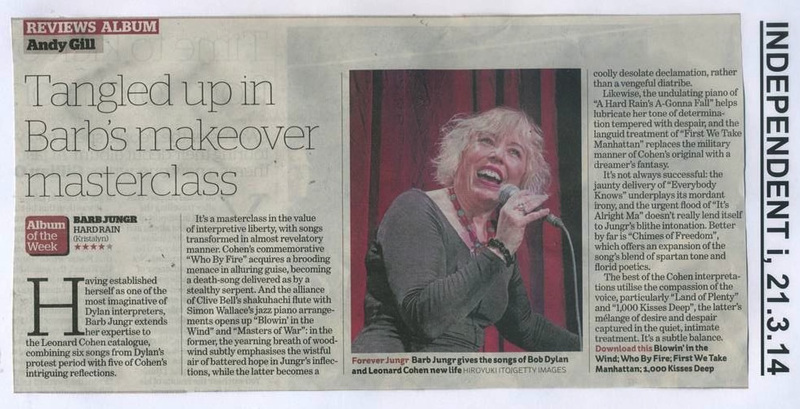 "Barb Jungr affirms her reputation as a consummate Dylan interpreter with a collection of Bob's political and spiritual narratives augmented here by similar matieral from the pen of his contemporary, Leonard Cohen...nourish jazz bues arrangemtns compound her ethereal impressionism. Its quite some achievement to throw new light on these old tableaux." 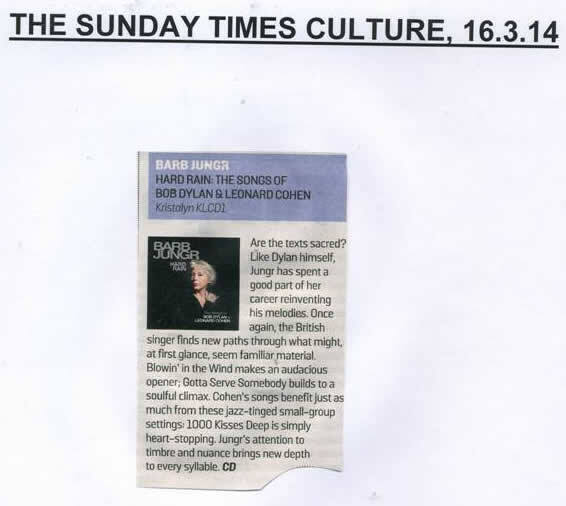 "The commanding and rhapsodic singing brings connection and insight while superlative arrangements - majoring in opulent blues jazz noir settings, refresh songs as daunting as "It's Alright Ma (I'm Only Bleeding)" and "First We Take Manhattan". To give such standards precious new life is quite an achievement." 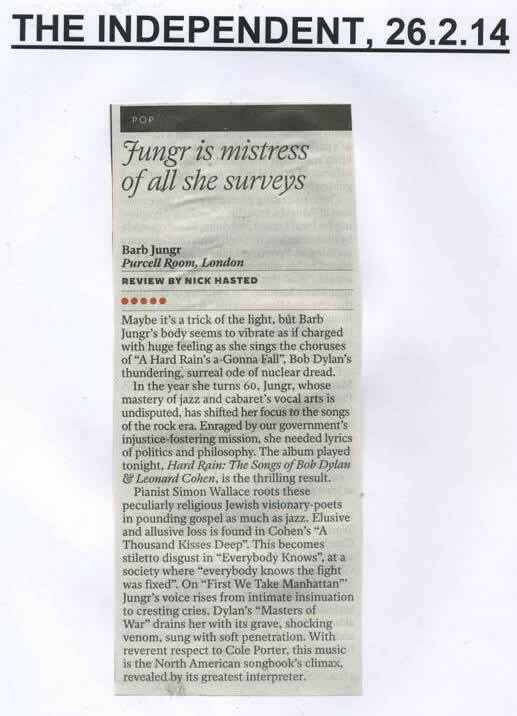 "Jungr has the ability to take a well known song and make it her own. This is a knockout album." 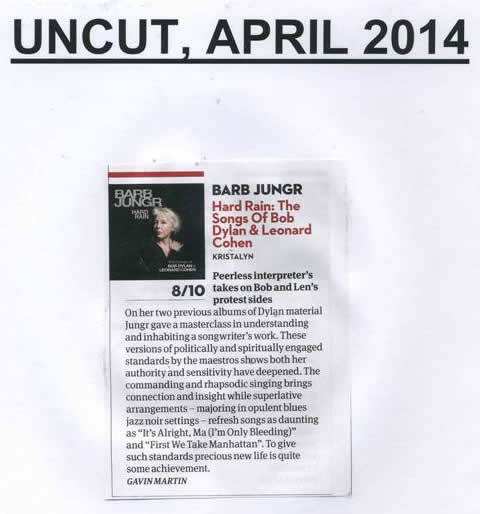 Barb Jungr has a powerful tool in the box - and that is her voice. Combine this with the powerful songs of Bob Dylan and Leonard Cohen, and a group of good musicians, and you have something which has the potential to blow your mind. So, Barb sets high expectations and this album does not disappoint. Hard Rain is a great album, one in which to immerse yourself until you are soaked through. It is always a brave project to do a covers album of any kind without sounding like karaoke versions, tribute bands and the likes, so when this arrived and saw it was Bob Dylan and Leonard Cohen standards, reviewing this was always going to be a challenge, but like any forms of music it is always good to hear differing interpretations of classic tunes. This however is one release that different can be very good which this release is. 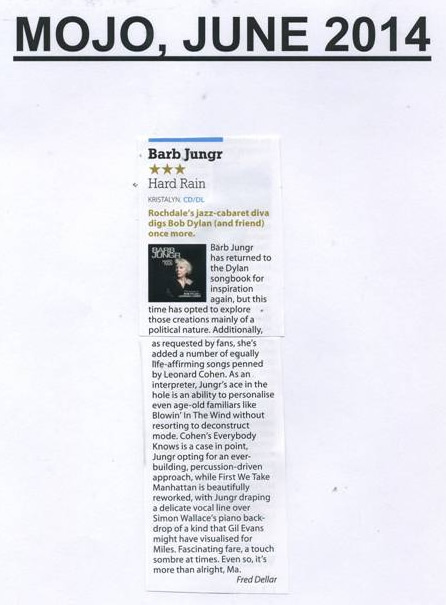 Barb Jungr is known for being one of the best female performers of Bob Dylan material and certainly is a wonderful singer with great tone and smooth jazzy voice which especially goes well with First We Take Manhattan. The songs are very strongly interspersed with political stances especially noted in the six titles by Bob Dylan with Masters Of War being a particular haunting melody and very gritty interpretation and sneering vocals but set to a slow seductive style, an ongoing feel to this release. It is also interesting she has arranged every song herself and obviously self-confident to do justice to such songs as, Blowin’ In The Wind and Hard Rain. Ably assisted by Simon Wallace on piano, Hammond organ and synthesiser, who also produced this collaboration and with a consummate backing band, this all adds to a hypnotic lilt and a wholly unforgettable release, brilliant. 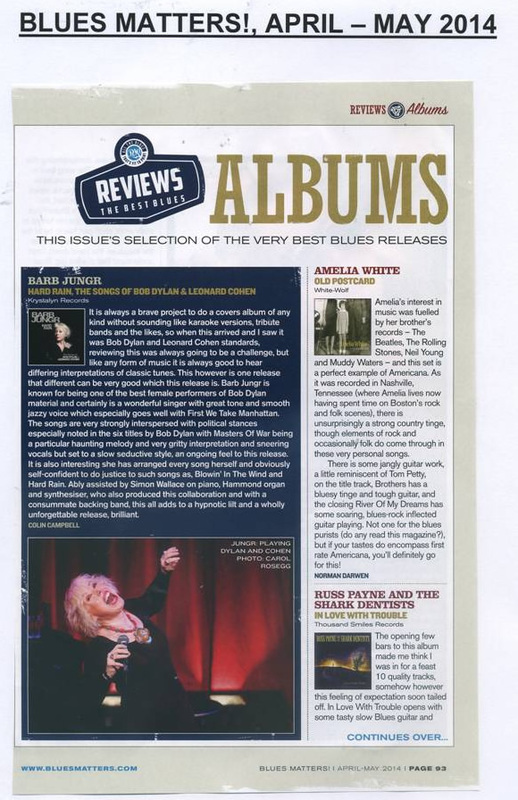 AXS - Top 15 jazzy vocal albums of 2014: Get ‘em while they’re hot!